If you have suffered a significant loss as a result of the negligence of a Barrister or other Lawyer you will not only have suffered a loss but will rightly feel badly let down. It may seem a daunting prospect to seek any redress or compensation as claims against Lawyers are known to be complex and difficult and the Barrister or other Lawyer is almost bound to have Insurers and an experienced legal team ready to fight the case. However if the Barrister or other Lawyer has been negligent and caused you a significant loss you should be able to recover the compensation you deserve, through a professional negligence claim against the Barrister. We have a substantial amount of experience in assessing cases involving Barristers negligence and have successfully pursued many cases involving Barristers negligence. We are often involved in Solicitors negligence cases where there are issues as to the advice provided by the Barrister. Sometimes the Solicitor has an arguable defence because of the advice of the Barrister and sometimes the Barrister has an arguable defence because of the nature and extent of the instructions given by the Solicitor or due to changing circumstances known to the Solicitor but not communicated to the Barrister. We are able to use our expertise and considerable experience to assess and advise on difficult cases involving Barrister's negligence and mixed cases involving Solicitors too. 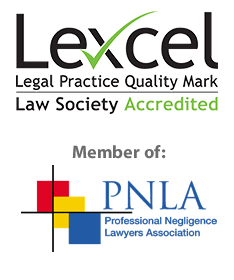 As these claims are often complex it is equally important to choose a Solicitor with sufficient knowhow and experience in similar negligence claims against Solicitors, Barristers and other Lawyers to ensure that you receive the right help and guidance and to achieve the best outcome for your case. It is important to use an experienced team when it comes to making any sort of claim against a Barrister or other legal professional because these cases are often complex and difficult and the Barrister and Lawyers’ Insurers will use many legal arguments to challenge your claim. When a case goes wrong there are often difficult aspects to the case, which led the Barrister or other Lawyer to make a mistake. This gives the Barrister or other Lawyer’s Insurers the opportunity to argue that not only was there no negligence, but even if there was, your case would not have succeeded or obtained the outcome which you say was lost by the Barrister or other Lawyer. Our team specialises in professional negligence claims against Solicitors, Barristers and other Lawyers, which means that whatever type of claim you need to make we can help. All of our current professional negligence cases are against Solicitors, Barristers and other Lawyers. We have over 25 years experience in pursuing Solicitors, Barristers and other Lawyers negligence claims from all around England and Wales and you can feel sure that our team of legal experts can help you get the compensation you deserve.